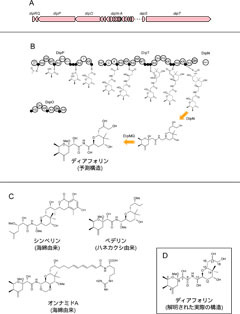 Nakabachi A, Ueoka R, Oshima K, Teta R, Mangoni A, Gurgui M, Oldham NJ, van Echten-Deckert G, Okamura K, Yamamoto K, Inoue H, Ohkuma M, Hongoh Y, Miyagishima SY, Hattori M, Piel J, Fukatsu T. (2013) Defensive bacteriome symbiont with a drastically reduced genome. Curr. Biol. 23(15): 1478-1484. 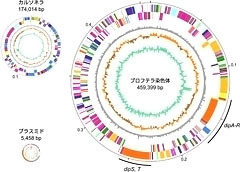 Nakabachi A, Yamashita A, Toh H, Ishikawa H, Dunbar HE, Moran NA, Hattori M. (2006) The 160-kilobase genome of the bacterial endosymbiont Carsonella. Science 314(5797): 267.